At Spotify's big press event in New York today, CEO Daniel Ek announced that, as suspected, Spotify has become a music platform atop which app developers can build their own apps. This will improve the Spotify unlimited music application on the desktop, because it will add "best of breed" apps like Songkick (concert tickets) and TuneWiki (real-time lyrics display) on day one. But what about the smartphone, which is arguably Spotify's most important platform – first because it's portable, and second, because that's where the paying users are? And why can't these app developers charge for their Spotify add-ons, include ads, or receive some sort of cut in return for improving Spotify? At today's announcement, we tracked down Spotify director of product development Charlie Hellman and put these questions to him. In classic Spotify fashion, the company is going after the biggest piece of the music fan pie first: people who don't pay for recorded music - and they're only on the desktop version. "When you're inside Spotify, you're being monetized for the record labels via ads, so you already have the licenses to be streaming all these things on-demand," he added. "This is just the beginning - we certainly think there's going to be activity on desktop and mobile, but we felt like this was an important step." Fair enough. It stands to reason that Spotify would stay true to its vision of giving things away for free in order to lure consumers into eventually signing up for a subscription - and to include these apps on smartphones, tablets, and televisions now would bar free users from using them. That said, judging from what he - and the app developers we interviewed - said, mobile will be a part of this equation eventually. One reason Spotify's new third-party apps only run within Spotify is so that you can drag and drop stuff around from one of these apps to another, or to within the main Spotify application. For example, if you find out about a great new song using the Pitchfork app, you can add it to your playlist without having to search for it again, as well as sharing it with friends with one mouse movement. "The real power of these things is that if you like a song you hear, you just drag it over to a playlist, just like you would if you found a song anywhere else [within Spotify]. You can drag it to a friend and share. It's really natively integrated, which is something that you just couldn't do on the web. We're going to do other stuff on the web, but there's stuff you can do in Spotify that you just can't do anywhere else." One key feature of Spotify and other successful apps these days is that they're really simple. Spotify's approach of allowing users to install free, optional apps within the desktop player means that less-sophisticated users don't need to have all this stuff installed. Meanwhile, those who do won't need to hunt around the web or elsewhere to find Spotify-powered apps. "When we thought about how we wanted to deliver these [requested features], and there's one scenario where you add feature after feature and become more bloated," said Hellman. 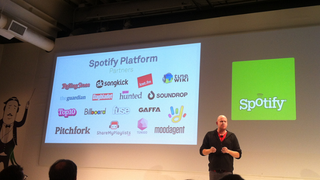 "One thing we hope happens here is that the out-of-box Spotify can still be dead simple. You come in and you can understand it, it looks familiar, you can search and stream. Then, if you're a Pitchfork guy, you add the Pitchfork app, and that's how you discover music. But if you're not, you don't have to, and you can keep it dead simple." We've already heard about how Spotify wants to help app developers sell Spotify-powered apps and split the revenue somehow, although it's complicated - especially when you consider that the money would have to be divided between copyright holders, Spotify, and app developers. "I think the potential for people to build a business on the Spotify platform will happen over time," he said. "This is day one, really, of us transitioning from being an app to being a platform. "We've taken steps in the past, but I think this is a much more aggressive step than we've made before. There are all varieties of businesses here - we have really small teams who want to get a name for themselves… and other brands like Billboard and Rolling Stone, who want an extension of their brand and a taste of what's so awesome about them. That's a nice proposition right now, but I'm sure it will evolve over time to have more facets to the economy of the platform." So there you have it: For now, developers of these new Spotify-powered apps can't develop these things for smartphones, tablets, set-top boxes, or cars. And they can't charge for their apps or include ads yet. But like they say, Rome wasn't built in a day.